Scientists experimenting in the field of television predict the perfection of practical home sets within a short time. This article explains the present status of television and tells of various methods of visual reproduction used in present Radio sets. WILL tomorrow’s home entertainment be furnished by a television set which, at the turn of a button, presents on a screen a visual and audible reproduction of a scene being enacted on a stage hundreds of miles away? If predictions of experimenters now working on television apparatus are to be believed, this is exactly what will be possible within a few years. Already there are several commercial television sets on the market, and there are a number of stations broadcasting for such sets. But as yet television has not been perfected to a degree where it is practical for the average man; it is in a stage of development roughly comparable to that of radio when dot and dash symbols were all that could be sent over the wire. At present there are several difficulties to be overcome before television can be considered practical. The neon lamp used in present sets produces a comparatively weak light. A strong source of light which can be actuated with the swiftness of the neon lamp is needed. Another necessity is for a dependable, foolproof method of synchronization. In the motor driven scanning disk method now used it is essential that the motor at the broadcasting station and the motor in the receiving set be turning at exactly the same speed. If they are not, an inevitable distortion in the image ensues. Various methods of approach to the problem of the perfect television set are open to scientists. One is to make use of no moving parts whatever, in which wireless impulses are received and converted into X-ray beams and thence into visual images. Another method is to use a vibrating mirror in place of the disk which now correlates and concentrates the radio impulses. The system in most general use today makes use of the concentrated neon ray, parabolic reflectors and lenses. C. Francis Jenkins, well known for his work with television, makes use of a quartz drum instead of the conventional perforated scanning disk in his latest sets. The quartz not only makes possible the use of a much smaller disk, but employs the principle of retention of vision to make the images smoother. The quartz drum takes less power to operate. I’m glad the idea of using X-rays didn’t catch on. No, but the cathode ray concept did catch on. The talk of using X-rays sounds to me like a (poorly described) reference to using a CRT. The electron beam in a CRT is, of course, not an X-ray; however, X-rays are generally produced by causing a high-energy electron beam to strike a target of some sort (within a vacuum tube). The overall mechanism of operation is quite similar, and could be easily confused. If they’re talking about actual X-ray beams, I have no idea how they intended to control or direct them without using moving parts. If it’s not practical to do so for visible light–and even today that’s true–then X-rays would be no different. I’d like to have seen a better description of the quartz drum. Did it have facets to reflect light to a translucent screen as it rotated? You’d need X and Y drums to scan the entire screen surface. Rather than reflecting, did light pass through the quartz? One entire rotation scans the screen top to bottom. Too bad this process requires a LASER BEAM!!! I love the caption under the tiny screened German TV on the first page “Note the comparatively large size of the screen”. It’s the same language you hear today comparing an iPod nano to an iPod touch. The screens must have been about the same relative sizes too. It’s interesting to see how much advancement occurred in just 9 years. 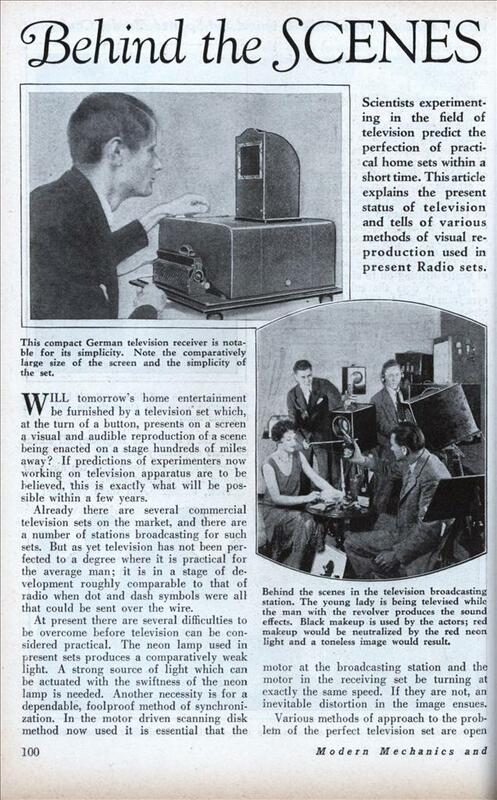 By 1939, RCA had a working TV that was not too different than the B&W TV of the 50s. The main difference was picture size and camera sensitivity. 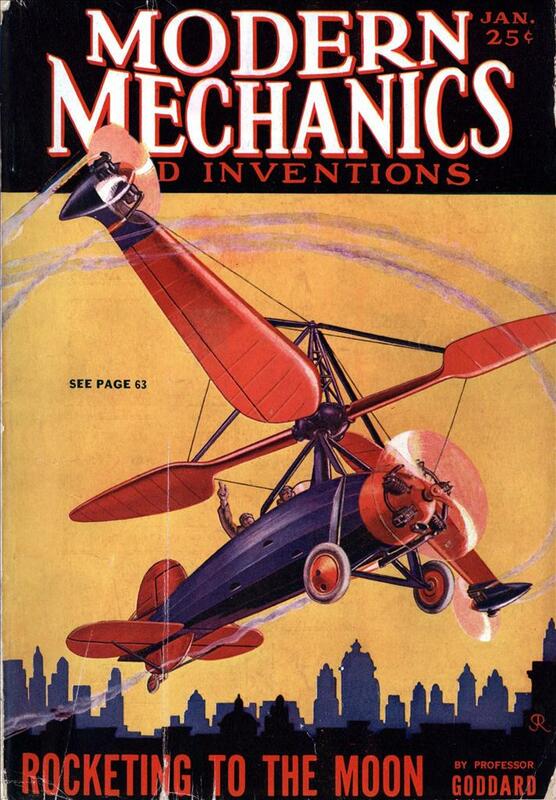 The 20s paradigm was a mechanical solution. Up until the 1920s, the whole field of engineering was strictly mechanical. Electronics as a whole was a very new subject. Most people still thought in strictly mechanical solutions. No moving parts television was described in the 1890s. The vacuum tube had to be invented/developed to make it possible. Go to Youtube, subscribe to aptsarchive. They have several documentaries on the development of television.